A couple of years ago I started collecting notebooks. I always come across the prettiest notebooks so it kind of hard not to buy. My love for notebooks has left me with tons of notebooks which I have uses for. It sometimes takes me a while but I a way to use. I thought I would share a notebook just lying around. I recently got a new notebook and decided to turn it into an art journal. It's my favourite thing at the moment. Art journaling is fun and a great way to get creative. This is something I recently discovered but I'm totally loving it. The concept behind this is to write three pages everyday. You just write whatever comes to mind and that's it. It really helps to reflect on your thoughts and just get some things out of your head. My bullet journal helps me so much but I don't think I use it enough. You can use your bullet journal to organise your, manage how much water you are drinking, write your to-do lists and the list continues. It's just about finding what works for you. Write some poetry. I love my poetry journal. It's a filled with my feelings and my 2am thoughts. Don't put too much thought into it, just write what you feel. Make lists of just about anything. Your favourite food, the things that make you happy, the things that you love about yourself. Just get a little creative and have some fun. Do you have any other uses for an empty notebook? I have been thinking about starting a poetry journal. 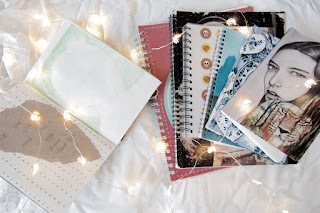 I love pretty notebooks too and to be fair I use them for all sorts of journalling. Faith, scripture, poetry, crochet journalling and a lot more. These are such great ideas! I really love the idea of the morning pages. Journal writing can be so therapeutic, it would be such a great start to the day. I keep a list journal and it's so handy to refer back to.